The Texas Restaurant Association, Texas Association of Retailers, Texas Hotel & Lodging Association, South Texas Property Rights Association, and the Texas Citrus Growers have joined forces in an effort to press the U.S. Congress to pass immigration reform this year. The groups noted that many industries face difficulties filling their open jobs with American workers. They have called their joint effort the Partnership for a New American Economy. Dallas remains in the mix of suitors for the 2016 Republican Convention. The party’s site selection committee made a few cuts, leaving Dallas, Las Vegas, Denver, Cleveland, Cincinnati and Kansas City, Mo. in the running. The last time Dallas hosted the Republicans was in 1984, when then President Ronald Reagan was formally nominated for a second term. Houston hosted the Republican Convention in 1992. The City of Austin considered a bid for the 2016 Democratic Convention but backed out. The last time the Democratic National Convention was held in Texas was in Houston in 1928. Only in Austin: The Texas Capitol Vietnam Veterans Monument is finally in place on the grounds of the state Capitol. The Texas legislature approved plans for the memorial in 2005 and a committee has worked tirelessly since then to raise the necessary funds needed to complete the project. Close to 500,000 Texans served in Vietnam, and 3,417 died there. There are more than 100 Texans still considered missing in action today. Personalized dog tags honoring each Texan who died or is missing are inside the memorial. A duplicate set of these tags is currently on display in the Texas Vietnam Heroes Exhibit, which will be in the Lower Rotunda of the Capitol until April 7. 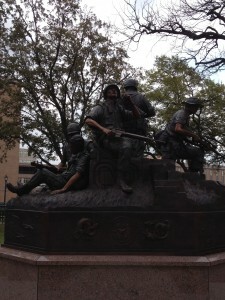 The monument is located on the northeast side of the Capitol grounds.